This week I was on the way to a conference in Illinois and changed planes in Chicago. I had time, so I stopped by Starbucks for some caffeine. I asked the barrister whether she shouldn’t be at sensitivity training. She laughed and said she thought it was a big joke. The executives of Starbucks certainly didn’t see it as a joke. This was May 29th, the day when most Starbucks (except apparently the airport outlets) closed down for sensitivity training. The employees were asked (on a voluntary basis) to take part in a workshop on countering bias and prejudicial treatment of customers based on their race or ethnicity. 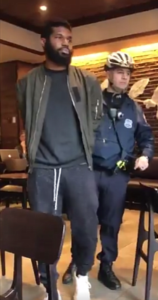 This developed out of an incident at a Starbucks in Philadelphia in which 2 black men waiting there to meet others for a business meeting were arrested. The rationale given by the manager was that the two men had not ordered anything and thus were not allowed, according to Starbucks rules, to be there. Many people have pointed out that if the men had been white, the manager likely would have not called the police. As good as that short video is, its effect, as well as that of the rest of the 4-hour training may expose Starbucks employees to the reality of inequitable treatment of African-Americans in public spaces, but there’s no guarantee that such knowledge will change behaviors. Sherrilyn Ifill comments in the film that when Whites in the US encounter Blacks they use “the shortcut that’s been wired into your brain because of the society we live in that tells you when you see me that you should be nervous”. Such prejudicial views may not be something we are aware of – it is likely to be a case of unconscious or hidden bias. This is a topic that has been studied in sociology and social psychology as well as discussed in public forums. The Project Implicit provides a popular online test, the Implicit Association Test (IAT) to reveal “your implicit associations about race, gender, sexual orientation, and other topics”. However, being aware of one’s implicit biases may not be the key to changing behaviors. A recent critique of the IAT by Olivia Goldhill in Quartz points out that “the implicit bias narrative lets us off the hook. We can’t feel as guilty or be held to account for racism that isn’t conscious. The forgiving notion of unconscious prejudice has become the go-to explanation for all manner of discrimination”. The article cites studies that have “found that reducing implicit bias did not affect behavior”. Hiring goals, diverse senior management, and penalties for those who repeatedly exhibit prejudiced behavior—rather than a soft talk about how we’re all biased but it’s not really our fault because it’s unconscious—would be effective alternative strategies for those serious about changing institutional inequality. In the US – and we’re not alone in this – we’ve made slow progress in bringing more diversity to upper levels of management and government. Seeing more individuals who are not white males in high social, educational, and other institutional roles may over time shift views. However, it is no easy task to change systems that benefit those holding privileged positions and thus have the power to hire and fire. This entry was posted in Conflict, Cultural identity, Stereotypes and tagged race, USA, whiteness. Bookmark the permalink. ← Chinese prom dress inappropriate?